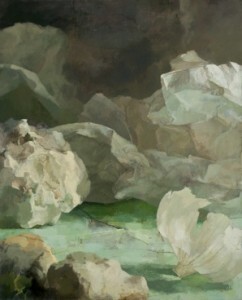 Whitfield Fine Art is delighted to present an exhibition of twenty one new works by Claudia Carr. Claudia Carr is a landscape painter; her landscapes are arresting and epic, evoking desolate and beautiful wildernesses. On closer examination the dreaming space Carr creates, these deserts and storms, are also still lives; of the transitory detritus of the artist’s studio, of miniature plastic animals, sea charts, string, take-away espresso cups, lumps of stale bread. These paintings create imagined spaces, where a camel treks past a head of fennel, distant wild horses graze across a desert of crumpled paper mesas. The incidental, intimate, miniature is rendered epic, elemental, and apocalyptic. Our perception of scale is altered as in Miroslav Holub’s poem In The Microscope, “here too are dreamy landscapes, lunar, derelict”. No, these aren’t still lives at all, not arrangements of dead inert things, chosen to symbolise status or tell a story. The objects in Carr’s setups become a living landscape; a deer appears beneath stone cliffs then leaves, perhaps to be replaced by a sinuous piece of string. The process of becoming these paintings go through is long and tenuous. Carr’s setups evolve organically, over time. “The landscape that needs to be there becomes apparent through looking and looking, rearranging, sometimes over years” she says. 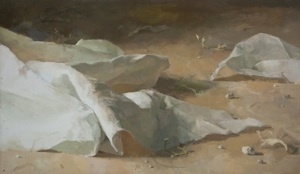 The painting emerges out of a daily rapport with something living, a sustained dialogue with light. Light animates the objects in the paintings, and observing that changing light in itself changes both the artist and the work itself. The work emerges in, recreates and challenges its viewer, with its always mysterious, often tense, reveries on experience, on becoming through the formal, emotional and observational aspects of looking. The landscapes that emerge are often marked by the erasures, durations and effacements of past iterations that leave imperceptible yet tangible ghosts, an aura that thickens the atmosphere of the work. Both formal and emotional forces determine the climate of these paintings, Carr’s subtle chromatic journeys, often in the infinite range of grey; create rhythms of colour and composition. Her paintings enact a poetics of space, as the gaze travels across and within the canvas and as our eyes “walk, think or dream, we elaborate thousands of invisible maps that constitute the unrepeatable graph of our becoming” (Bachelard). Stillness, movement and perspective are held in tension within the paintings, as in Leone’s opening sequence for Once Upon a Time in the West. Like cinema Carr’s painting is a time-based medium. We are not presented with a frozen moment. The paintings change through observation, as does the observer. The surface of the painting is material, marked by the time of light, painting, effacing and erasing, remembering, looking. All that time and most importantly of all the duration of looking, which is a time not of interpretation but of becoming, comes to the surface. Something subtle, intangible, that can’t be verbalised, is enacted in this space, the space between the object, and the act of looking. The surface becomes a terrain that impels experience, encounter, the event. The site becomes a situation; the object becomes an experience. Carr’s paintings play with scale but her work does not engage with the charm or uncanniness of miniaturisation and kitsch. Hers is not the world made safe and controllable, domesticated. 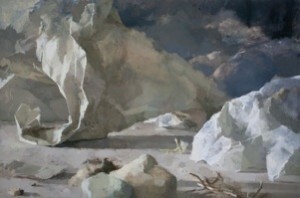 Carr’s landscapes create the spaces of primary perception, “the space of our dreams and that of our passions (which) hold within themselves qualities that seem intrinsic: there is a light, ethereal, transparent space, or again a dark, rough, encumbered space; a space from above, of summits, or on the contrary a space from below of mud; or again a space that can be flowing like sparkling water, or space that is fixed, congealed, like stone or crystal” (Foucault). Moving between registers of abstraction and representation, Carr’s paintings inhabit a realm where looking moves between the two, as when a child summons figures out of the stains and shadows on the walls in their bedroom, or an over familiar face dissolves into planes of light and dark. Perhaps it is no coincidence that many of the animal figures Carr uses in her paintings are the same brand used by psychoanalysts. The tiny wild creatures who wander so delicately and equivocally through her landscapes interrogate rather than sentimentalise childhood. The observer is invited into a space of complicity with the paintings, into what Winnicott calls ‘the potential space of play’ between the individual and the painting. For Winnicott play is not simply a question of leisure but provides the potential space for the individual self’s creative interaction. Play casts us into a potentially transformative space, one created by the flow of intense and variable experiences: flows and currents created by the experience of interrelationship between the viewer and the work. To paraphrase Walter Benjamin, Carr’s paintings are not a window on the world, but a technology for beginning to understand our place within the universe. Part alchemy, the magic of play that transforms a grinning child’s toy dinosaur into an enigmatic prehistoric shadow, and part philosophy, Carr’s paintings invite us into “an empty time of singularities or virtualities existing in between what we take to be the defining moments of an individual’s life”. Deleuze describes this as the time of becoming, that which takes place between defining moments, beyond narrative, where “what is common is impersonal and what is impersonal is common”. Here lived experience “unfolds according to a different logic than the life of an individual. It can never be grasped fully; it is always yet “in the making,” in potentia” (Deleuze). The exhibition takes its title from an early Lorca poem, which speaks of the remanso (a remanso is a still pool within a running stream) of the air under the branch of an echo. Carr’s paintings are a remanso of imaginary spaces in empty time, the singularity and universality of instants dissolving, flowing, and coming into being. G. Bachelard (Tr. Maria Jolas), The Poetics of Space (1958). Massachusetts,1994. Benjamin, Walter, “A Child’s View of Art” (1914), “Reflection in Art and Colour” (1914) and “Painting and the Graphic Arts” (1917), in Selected Writings, Volume I. Harvard University Press, 1996. G. Deleuze (Tr. Anne Boyman), Pure Immanence: Essays on A Life, New York, 2001. M. Foucault, “Des Espace Autres,” Tr. Jay Miskowiec. (1967) http://www.foucault.info/documents/heteroTopia/ Accessed on 10.12.2006. D.W. Winnicott, Playing and Reality London, 2005.